Soh shang occurs through out in the hilly regions of East India. 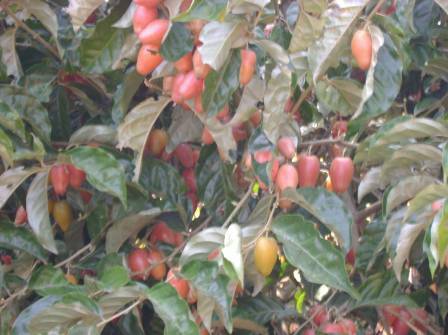 It is quite popular Megahlaya and Arunachal where the fruits, picked from wild, are also offered for sale in small towns. A large woody evergreen straggling or scandent shrub,often spiny; bark blackish grey, rough, often with raised lenticels; branchlets densely crowded with ferruginous scales. Leaves alternate, very variable, usually 5-15 cm cm long and 2.5 to 7.5 cm wide, ovate-oblong or elliptic, acute or acuminate, entire of sligfhtly undulate, subcoriaceous, glabrescent above, clothed beneath with silvery or ferruginous scales. Flowers often peduncled, 1.25 cm long, 5 mm wide, scented, few or dense in axillary fascicles. The fruits are eaten fresh out of hand. Some people, who find the fruits too sour for their taste, mix a little salt with the fruits. 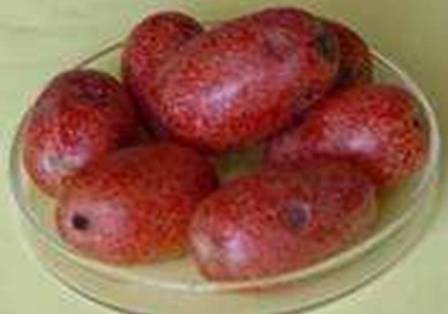 The fruits are perishable and do not stay for more that 3-4 days at room temperature. The plant besides providing edible fruits is also quite showy because of the presence of silvery scales. It is therefore quite suitable for planting in the home as well as public gardens. Soh shang plant requires well-drained soil and can be grown in nutritionally poor acid soil. It can be grown in dry as well as in moist soil and can tolerate drought. This species has a symbiotic relationship with nitrogen-fixing bacteria. Soh shang can be propagated by both seed and cutting. Seed should be shown in nursery within a week after extraction from fruit otherwise seed will lose the viability up to 50- 60%. Cuttings of mature wood of the current year’s growth, 10-12 cm length of pencil thickness having 3 nodes should be planted during rainy season in nursery or poly bag filled with soil mixture. Cutting takes 15-20 days to start sprout and ready for planting in field within 3-4 months after sprouting..
Plants are planted at 4 m x 4m spacing in square planting system. It starts bearing at 2 years after planting. A mature tree has been found to yield around 10-15 kg fruit per tree in Megahaya, India.